Cycling through multiple dashboards on a single screen. Dashboard loops allow you to create a single link that cycles through multiple dashboards on your account, displaying each dashboard for a select time interval. You may include as many dashboards as you'd like in a single loop, and dashboards can belong to multiple loops. Each additional dashboard in a loop counts towards the total number of dashboards your plan allows. Click Loops in the top right area of your screen. Under Loop Name in the Add loop modal, add a name for your loop. Under Interval, select a time interval. The interval defines how long each dashboard in the loop will be displayed before cycling to the next dashboard. From the drop-down menu select a dashboard you want to include in the loop, then click Add. Once you're done adding dashboards to the loop, click Save. This will generate a sharing URL. On the timed notification window, click Copy sharing link to share your loop. You can effortlessly change the ordering of dashboards in a loop just by dragging and dropping your dashboards into the order you want. 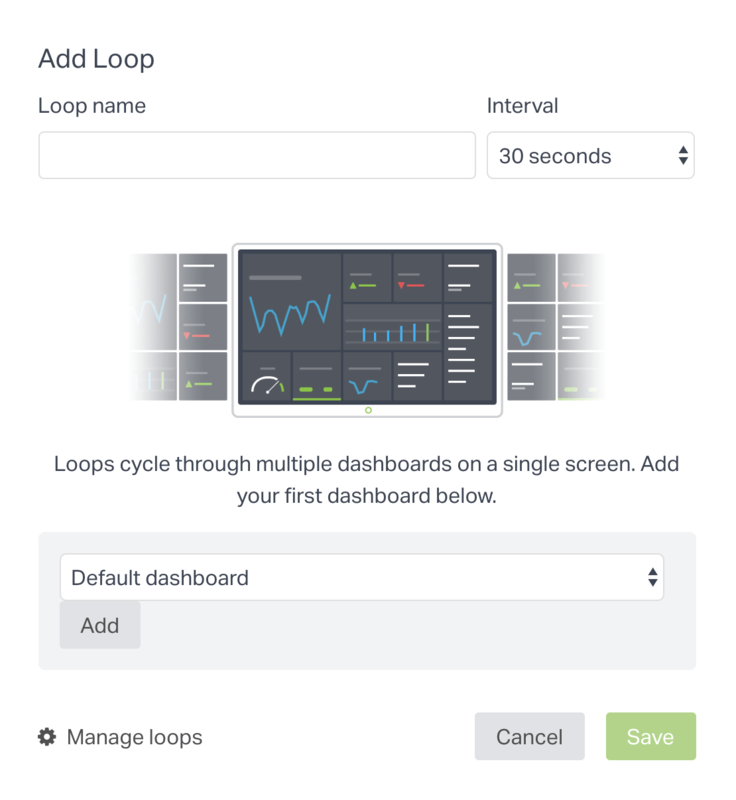 By default, a loop will display all dashboards in the loop to anyone who clicks the link, unless you set up IP restrictions or revoke the dashboard loop. If any dashboard in your loop is restricted, anyone viewing the loop from a non-whitelisted IP address, will only be able to see the unrestricted dashboards. For a secure loop, make sure that the IP address of the location where you intend to access the loop from is white-listed.